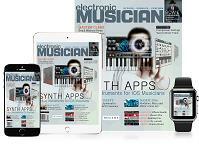 Electronic Musician offers two ways to subscribe. Choose the All Access option which includes print and digital versions of Electronic Musician or the Digital Access option. Either way, Electronic Musician is a great read!